With backgrounds in jazz, rock, and soul, members of the local quartet carry on a funky tradition in a uniquely West Coast style. The M-Tet began as a study in Meters songs. The M-Tet began as a study in Meters songs. Although a quartet, The M-Tet emulates a much bigger sound. 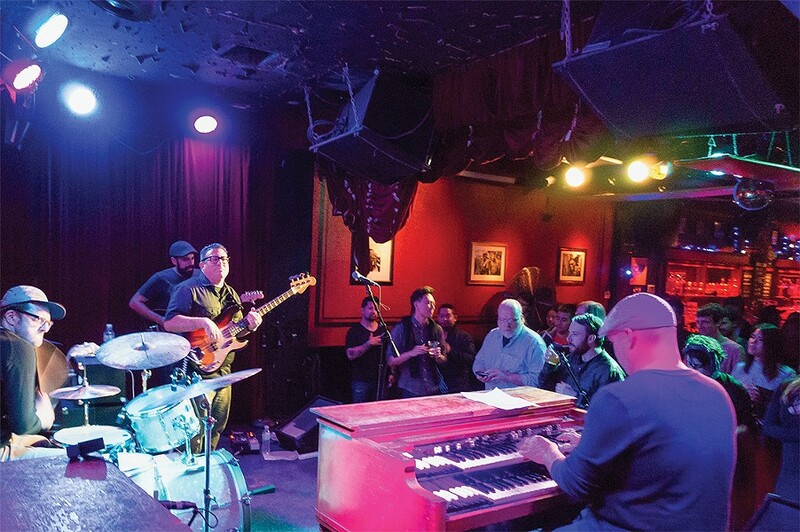 With a studied, slow burn, the organ-forward instrumental group tackles Meters tunes and original compositions that are funky, soulful, and jazzy in a uniquely West Coast style. "I've always liked a small band that does whatever it can to sound big," said Pittsburg-based bassist Chris Lujan. "The Hammond [organ] is my favorite instrument, but I can't play the thing. I love the way it screams and the way it can also whisper." The members of The M-Tet are rooted in '60s- and '70s-era style and production: Their albums are recorded straight to tape, they believe in digging for vinyl (and even wrote a tribute song to local record shop VAMP), and they have a deep love for instrumental funk. Lujan originally conceived of the band as a study in Meters songs, only to find a group of like-minded musicians with diverse backgrounds ripe for exploration. "Mike has a background that's more hip-hop-based. I have more experience in jazz and rock, Chris has more experience in soul and R&B, and Gary has the most experience in classic rock," said Baer Magnant, an East Coast native who came to The M-Tet through Craigslist. "I think our sound has evolved to include and represent each one of those styles." As a testament to their skill and seriousness, the members of The M-Tet were able to play all 12 songs from The Meters' first album during their very first rehearsal. The band played its first show at Neck of the Woods in San Francisco in late 2012, and then took more than six months off before coming back to jam and record. In 2014, The M-Tet recorded their first single, a lo-fi groovy tune called "Number One" in a one-room studio with no headphones. The band's first album, Hot Buttered Rum, was released digitally on Lujan's Lugnut Brand Records that same year and featured an even mix of originals and covers of groups like Funk, Inc. The M-Tet's ability to take inspiration from their funky roots while concocting mellow grooves and church-rocking arrangements caught the ear of Detroit-based DJ Frank Raines, who dug the band's cover of the 1970 Charles Wright classic "Express Yourself" (which was famously sampled by N.W.A.). Raines, one of the brains behind Funk Night Records, began sending The M-Tet songs to record and just released their latest single, "Pick and Shovel." "Every once in a while I hear a song I think would be perfect for them to play. They're really tight and have their sound on lock," Raines told the Express. "There aren't really other groups like them, they have their own kind of style and are parallel with a lot of other groups I [produce]." The M-Tet's most recent album consisted of a dozen original tunes, pressed on vinyl. Long Play is a showcase of more soul-jazz influences such as organist Jimmy McGriff as well as James Brown's band The J.B.'s, offering an all-killer, no-filler record with unique arrangements and solos. "As time goes on, our songs become much more simple and more of a specific idea," Baer Magnant said, adding that The M-Tet's newer tunes will often have a single rhythmic groove that reflects how well the members work together. "As you get more experienced, the more likely you are to work at the speed of your inspiration. With the older stuff, we're still trying to figure out what we're doing." If The M-Tet are still trying to figure out their sound, it's not apparent on stage. The group has had a monthly gig at Cafe Van Kleef for more than two years and regularly gigs at The Legionnaire Saloon and Jupiter; earlier this month they opened for Daptone Records' The Sugarman 3 at Brick & Mortar Music Hall and have opened for Lee Fields & The Expressions several times. Lujan hopes The M-Tet can continue to open for their soul and jazz heroes, further cementing the band's place in the growing musical community that values simplicity and soulfulness, which includes locals Monophonics and Ohio-based instrumental soul champions Colemine Records. More recent efforts have included backing a Chicano soul harmony group from San Jose, Thee Baby Cuffs, on a political lowrider single called "Where Did Our Pride Go," which Lujan produced.